The RYA Safe and Fun course is suitable for anyone working with children and vulnerable adults in an RYA environment. This includes those volunteering or working at recognised training centres and affiliated clubs. This course is fully online. Is the Safe and Fun course a CPD Accredited Activity? The Safe and Fun course is accredited by the CPD Standards Office. This means that completion of the course can be used as evidence of three hours of Continuing Professional Development. This will not be relevant to everyone taking the course, but is a useful addition for any students who require a record of their CPD for their professional body, regulator or employer. 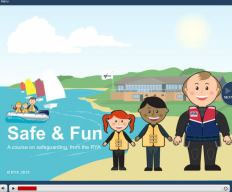 Once you login, on the Safe and Fun course page there are instructions for how students can claim their CPD Certificate of Completion from RYA Training, if they need one. Please note that the CPD certificate is an optional extra and does not replace the usual RYA certificate which students download on completion of their course and knowledge check. Who is required to take the RYA Safe and Fun course? Can anyone who isn’t an instructor take this course? How do I sign up for the RYA Safe and Fun course? Just click the prefered payment button below. Whats included in the purcahse? I’ve already taken a different safeguarding course elsewhere. Can this be used instead of a RYA Safe and Fun course for my instructor course? The RYA Safe and Fun course forms the basis of the safeguarding workshop that you will complete during your instructor course and puts safeguarding issues into context specifically for those instructing at RYA centres or clubs. It is therefore not possible to use other courses as alternative certification prior to your Instructor, Senior Instructor or Level 2 Racing Coach Course.